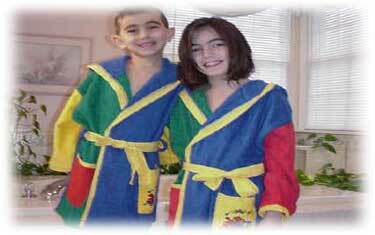 Al-Farooq Enterprises manufacture all kind of bathrobes like Kimono, Shawl Collar, Hooded Style Kids bathrobes etc. We are a trusted & reliable name, associated for long with Bathrobes because of excellence in producing finest quality products have established ourselves as the undisputed leader in our sphere of operation in a short span of time. Backed by an experience of over three decades. Made from soft and luxurious cotton towelling, our classic bathrobes feature a stylish shawl collar. Made from the finest quality of towelling a Kimono Bathrobe. All colors and sizes are available. Super soft cotton velour bathrobes with a warm and cosy hood. Plain robes are available in almost all colors and sizes. Stripy robes available in custom colors. Machine washable. Super soft cotton velour bathrobes with a beautiful shirt style. Plain robes are available in almost all colors and sizes. Stripey robes available in custom colors. Machine washable. Made from the finest quality of towelling a Kids Bathrobe in verious colors and designs. All colors and sizes are available.